"We are the Nazis, there is no escaping it. Nazi is a condition of humanity." Animal exploitation, killing and abuse is at an all-time high and the suffering we humans inflict so sickening, so shocking, so painful to bear witness to that the majority turn away from the activist photographs which shine a light on this darkness, in horror begging: “Don’t tell me. Don’t tell me, I don’t want to know.” But Sue Coe’s clever political art gets right in, under the radar. She unlocks hearts like no other and forces the wilfully blind to see. Doing what art does when it’s at its best, inspired, courageous and just about bearable, she shatters our complacency with her vivid, evocative empathy, her highly memorable compassion. Sue Coe tells it as it is, from the animals’ point of view, in sharp, black and white woodcuts. She emblazons the need for change on our reluctant, human consciousness. She dreams the dream of a humane, vegan world, Martin Luther King-style. This is a book in two parts. The reality of our man-made Death cult in which a slaughterman can pitch-fork a living baby piglet, a human fist can hover menacingly over a newborn male chick, ready to smash him into non-existence and a baby lamb can so casually be turned into so much minced meat, is presented with an uncompromising commitment to the terrible truth. God-given lives are Satanically alchemized into meaningless bags of money, by a gang of greedy men. Lobsters are boiled alive by indifferent chefs. We witness the terror of a cow being forced into the abattoir while her desperate calf tries to cling to her. We see (and our imaginations hear) the hysterical weeping, leaping and screaming, the terrible grief of some sows as they watch helplessly as one of their youngsters is stunned in preparation for his imminent murder. Organic, free range, crate free “Happy Meat” is shown to be anything but. While we eat, drink and continue to be merry, the animals die. A couple sit, wine in hand, over yet another roast dinner – surrounded by the spirits of all the animals whose lives they have directly taken (over 11,000 per person, per lifetime, according to VIVA! figures). Animal suffering – emotional as well as physical – is given full vent. We witness the abject misery, the highly conscious teardrops of a trapped, ‘battery’ hen, of a grief-stricken cow in the presence of her murdered calf; the depression, profound pain (and grave sense of injustice) of an innocent pig locked inside the dark hell of his ‘prison cell.’ Lions weep in their cages; elephants are literally brought to their knees in heavy ‘circus’ chains. In a bleak landscape, filled only with dark, ominous tower blocks and dead tree stumps, a lone wolf is trapped in agony, his front leg gripped by a deathly leg-hold trap. A crying angel comforts a bleeding goose whose feathers have been excruciatingly ripped out through live plucking. A ewe hugs her lamb-child with such tenderness against the terrifying backdrop of a missile attack: a bleak reminder that human bombs rain down on animals too. Genetic mutations, vivisection, the gassing of unwanted animals, Sue Coe does not leave a single tombstone unturned. 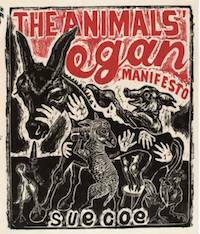 The Animals’ Vegan Manifesto also shows us the madness of it all: the two-faced, Janus heads of Man who with one arm affectionately strokes his dog, while with the other he stabs a baby lamb in the throat with a knife. Men devour platefuls of meat, while a Third World child starves to death. An autocratic father force-feeds his baby with a young piglet, creating the seeds of his own child’s premature demise. Another man devours two, huge turkey legs - and with them pus, salmonella, e-coli, and an early grave. In part two, the tide finally, mercifully turns and we are shown what could be - what will ultimately be. Sue Coe has a Martin Luther King-scale Dream. There is love in the skies, in the heavens; animal angels are shown to be the guiding stars of their animal brethren. There is hope. And there is liberation. On pages 57 and 58 a cow cuts through the barbed wire of some hell-hole of a farm under a bright moon. Her act is deliberate and conscious, and we know that it will ultimately be effective. On page 63 a goat does the same. On pages 74 and 75 two brave pigs follow suit. Chains are broken, and the animals, literally, see the Light. There are human cries too, vegan cries for "Freedom! Peace! Justice! Stop Violence!" The vegans become far greater in number, unwilling to participate any longer in the meat industry’s blood money scam. A thin, but determined donkey walks through the night towards a new Vegan World which is only 155 miles away. Other animals find the path too and begin to pursue it hopefully; they carry a V banner above them. An Isaian world begins to manifest: a mule embraces a dog, a cow and a pig write a new law: "Eat veg, not us," another cow scours The Vegan News for inspiration, and the animals unite in a common mission for love and unity. They help each other – and they find their freedom again. They share a vegan meal together, and they sleep soundly in the protective care of each other. A bat heralds rebirth and more Good News. The bears enjoy their tree tops again; bucks and fawns leap for joy, fish dance in ponds. Shooting stars break out in the night skies as a choir of wolves sing to the new world; butterfly and grasshopper exchange flowers, a sunflowers bursts into fullest bloom. A woman holds a calf in her arms, expressing her deepest, motherly/sisterly love, clearly mourning all the terror, pain and violent death which man has inflicted on the animals for so long. There is great rejoicing as the world finally becomes vegan. Miraculously, a hardened scientist breaks out of his own man-made cage - and stretches out to embrace the animals, while a cockerel heralds a new vegan dawn. Sue Coe grew up next to a slaughterhouse in Liverpool. In The Animals’ Vegan Manifesto she conveys the most important message of our times, about the last, most terrible, most prolonged, mass slavery and life-engulfing genocide the world has ever known. There is great love in these pages and her vision is Biblical in its moving magnificence. She has done what a thousand words from a thousand writers have failed to do. She is a true prophet of our times - and her book is essential reading. If you buy just one book this year, let it be this one. eat plants, not us, thankyou. Sue Coe is a keen observer, a 'graphic witness' to realities more often overlooked or avoided. She is a journalist who uses printed images in preference to words. For a quarter century she has explored factory farming, meat packing, aparteid, sweat shops, prisons, AIDS, and most recently, war. Her commentary on political events and social injustice is published in newspapers, magazines and books. The results of her investigations are hung in museum and gallery exhibitions and form an essential part of personal fine print collections by artists and activists alike. Coe paintings and prints are auctioned as fund raisers for a variety of progressive causes, and since 1998, she has sold prints here to benefit animal rights organizations.